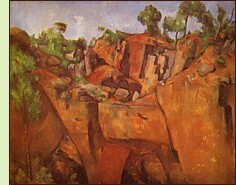 Cézanne's Quarry is a murder mystery spun around the love affair French artist Paul Cézanne is supposed to have had with a mysterious woman in Provence in the 1880s. Several of his artworks feature in the plot, including a nightmarish early painting depicting a woman being strangled. The murder victim in Cézanne's Quarry is beautiful Solange Vernet, a woman interested in Darwin's theories who, along with her English lover Charles Westerbury, has been hosting an intellectual salon in Aix-en-Provence. Her corpse is found in a quarry: "Her hair, unbound, shining under the rays of a merciless setting sun, looked like it had burst into flames. That magificent golden-red hair, which he had always seen pinned up, rising gracefully from her long, white neck." Through the memories of several other characters, readers come to understand and sympathize with the unconventional Vernet long before the full truth about her is revealed. The chief suspects are the love-struck Cézanne and Westerbury, whose noisy quarrel with Vernet over the artist does not remain secret for long. The judge responsible for uncovering the truth, intelligent but inexperienced Bernard Martin, has been left in charge in Aix while the others vacation during the August heat. It's his misfortune to supervise the supremely confident police inspector Albert Franc, "a man known as much for his toughness as for his disregard of the finer points of criminal procedure." Martin struggles to maintain his nominal authority over Franc, whose insolence, perpetually teetering on the verge of defiance, is almost as appalling as his eagerness to exercise his skill in "questioning" prisoners. Cézanne's Quarry is one of the five mysteries on my "Best Historical Novels I Read in 2009" list. Cezanne in Provence , a 2006 documentary from PBS about Cézanne's life and art.